Simena Holiday Village & Villas is a 5-star all-inclusive family friendly resort located in a serene region of Kemer district, Comyuva. The hotel is only a few minutes’ walk from the beach. Endowed with amazing natural scenery, a fine beach and ample sunshine, Comyuva is a top choice of travellers for a fun-filled holiday. Overlooking the Tahtali Mountain, 180 modern guestrooms at the hotel invite guests to enjoy a comfortable stay amidst luxurious amenities like parquet or tiled floors, a TV and a balcony. 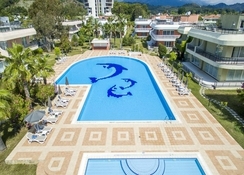 The hotel offers an outdoor heated swimming pool, a tennis court and water slides. The sister hotel adjacent to the Simena Holiday Village, throws open its gates to guests of Simena Holiday Village & Villas. This hotel features a private beach, outdoor and indoor pools, fitness centre and spa with a sauna and a Turkish bath. 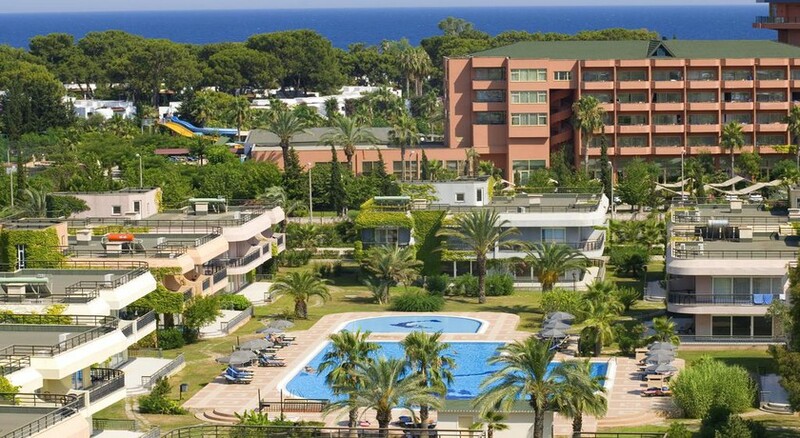 The 5-star hotel is located in a serene region of Kemer district, Comyuva just five minutes’ walk from the beach. The beach of Camyuva is popular as a campsite as well as with the sun worshippers. The beach, full of coloured stones and pebbles, is a relaxing getaway with deck chairs, exciting water-sports. The Tahtali mountains provide a picturesque backdrop to this sunny beach. The water is crystal clear and good for a rejuvenating swim. The Kemer town centre is 10km from the hotel. The Antalya Airport is 66.2km from the property. Simena Holiday Village & Villas has 180 modern well-appointed guestrooms with air-conditioning, central heating, in-room safe, a minibar, TV and a living area. The rooms have a view over the gardens and of the Tahtali Mountain. Guests will enjoy a shower, a hairdryer and free toiletries provided in the bathrooms. There is free Wi-Fi in all the guest rooms. Simena Holiday Village & Villas has an open-air restaurant serving local cuisine. 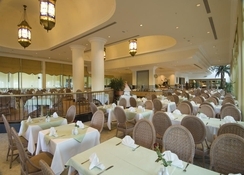 The Monte Lara Restaurant and Dolphin Fish Restaurant, serving a delicious array of cuisine are about 300m from the hotel. There is a snack bar serving refreshing drinks and light snacks during the day. The spacious disco bar offers billiards, a dance floor and live music. Guests can also dine at the restaurant and bar of Simena Hotel, just a few steps away. Simena Holiday Village & Villas offers ample leisure and recreational facilities to guests. The hotel features a nightclub, a sun deck and an indoor swimming pool. Facilities like windsurfing, basketball and badminton as well as aqua fitness and gymnastics classes are available. 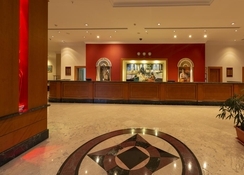 A fully equipped gym helps travellers stay active. Children can chill at the playground or kid’s pool with waterslides. Guests can relax with an exfoliating Turkish bath.